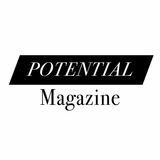 elcome to the third issue of Potential Magazine! If this is your first time reading, we are really proud of what we have put together and hope you enjoy. If you are returning, we can assure you that we have only gotten better. 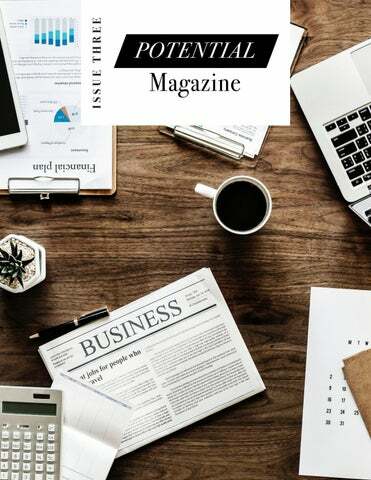 Potential Magazine hopes to be a source of knowledge and inspiration for people who want to venture into the world of private industry after graduation. Our team has gathered some incredible people and stories together for this round and we hope you enjoy! Finding work that you care about with a team that works collaboratively towards the end goal is something that a lot of us hope for when we start our careers. It, however, can be something that is very hard to find. 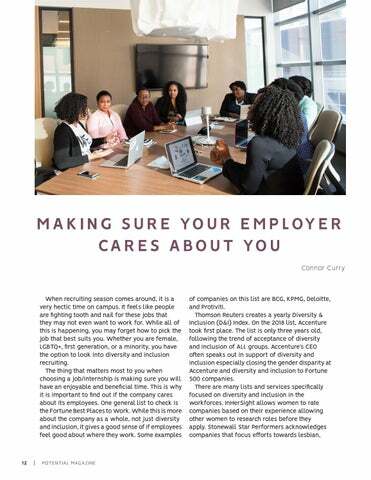 In this issue we are going to talk about how to find a company that will support the way you work and cares diversity and inclusion. Also, Evy has some great tips about what you can do to stand out in an interview without even saying a word. Finally, Maggie presents and interview with someone that successfully navigated through recruiting into a successful internship experience! 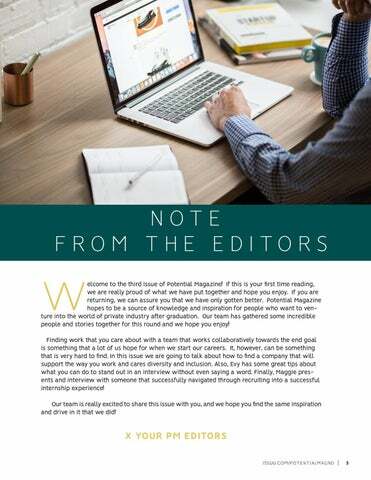 Our team is really excited to share this issue with you, and we hope you find the same inspiration and drive in it that we did! some great insight into what you want to be looking for in a team and in a company. Alexis shared with us she wants to see the team really be, just that, a team. She said, “Success is about building the team that can build the dream”. You should ask a question about exposure to management, “will I be able to interact with just my manager or people at all levels of the organization?” - for example. 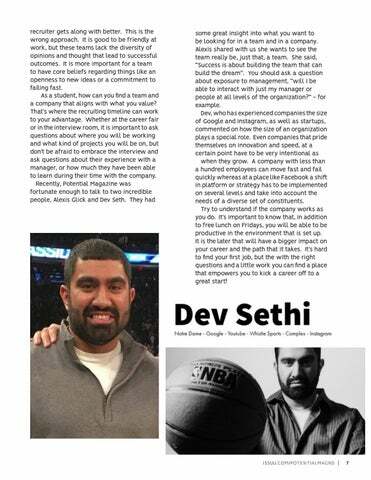 Dev, who has experienced companies the size of Google and Instagram, as well as startups, commented on how the size of an organization plays a special role. Even companies that pride themselves on innovation and speed, at a certain point have to be very intentional as when they grow. A company with less than a hundred employees can move fast and fail quickly whereas at a place like Facebook a shift in platform or strategy has to be implemented on several levels and take into account the needs of a diverse set of constituents. Try to understand if the company works as you do. It’s important to know that, in addition to free lunch on Fridays, you will be able to be productive in the environment that is set up. It is the later that will have a bigger impact on your career and the path that it takes. It’s hard to find your first job, but the with the right questions and a little work you can find a place that empowers you to kick a career off to a great start! a wide array of specialized services based on strong research solution-delivering capabilities” and provide “individual clients with wealth-management services meeting their individual long-term needs and risk tolerance.” The most exciting part of Meaghan’s opportunity was that after her junior year summer, Nomura Security offered her a permanent position at the company after her graduation. According to Forbes Article: Odd Are Your Internship Will Get You A Job: “if you are a college graduate and you are working a paid internship, a new study shoes, 60% of the time, that internship with turn into a job offer.” Or in other words, a decent percentage of paid internships turn into a job offer, such as in the case of Meaghan Haley. 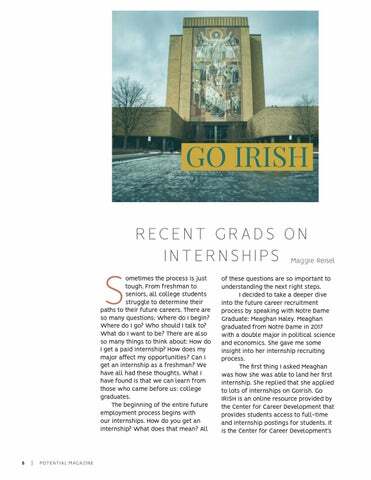 Overall, the main takeaways from my conversation with Meaghan is the importance of using the opportunities given to us by our Center for Career Development and more specifically Go IRISH. It is a wonderful resource to begin the recruitment process and find an internship that is right for you. hise month I had the opportunity to sit down with Mendoza professor Chris Stevens to chat about recruiting and hear his advice on this oftenintimidating process. “What do you bring to an interview these days, Evy?” he immediately asked. I hesitantly replied, “my résumé, a pen…”. 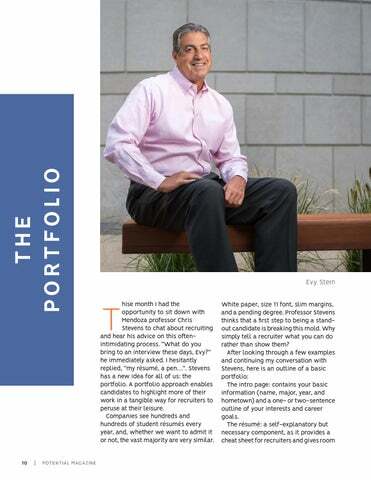 Stevens has a new idea for all of us: the portfolio. A portfolio approach enables candidates to highlight more of their work in a tangible way for recruiters to peruse at their leisure. Companies see hundreds and hundreds of student résumés every year, and, whether we want to admit it or not, the vast majority are very similar. Company statement: if possible, your portfolio will also include a tailored page for each company about your reasons for wanting to work there. This could be written as a formal cover letter, or in an infographic style. Overall, Stevens encourages us all to consider the portfolio as a way to provoke more thinking about what we seek in an employer and about what skills we each bring to the recruiter. 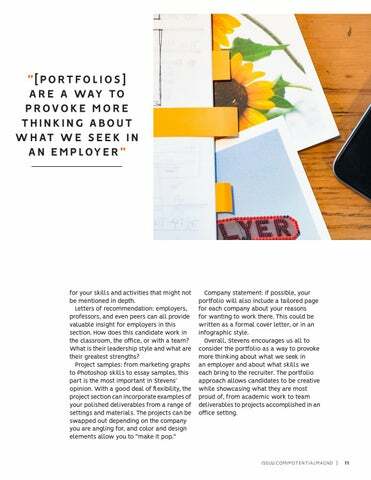 The portfolio approach allows candidates to be creative while showcasing what they are most proud of, from academic work to team deliverables to projects accomplished in an office setting. organization may not make it a priority. According to the Diversity Matters report by McKinsey, “Companies in the top quartile for racial and ethnic diversity are 35 percent more likely to have financial returns above their respective national industry medians. Companies in the top quartile for gender diversity are 15 percent more likely to have financial returns above their respective national industry medians.” So diversity and inclusion is better for business. Inclusion drives diversity. Ensuring that a business welcomes everyone and people don’t feel like they are the only person of their group will allow diversity recruity to be more successful and retention rates to be higher. Diversity and inclusion are a necessity to all business and working to put what makes you different in a workplace will better the world for all. 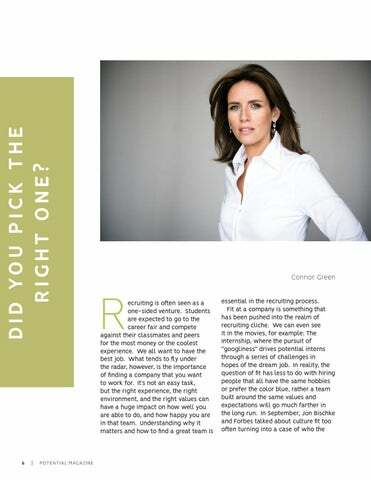 Did You Pick the Right One?